This weekend I started on the epic task that is cataloguing my “extra” books, probably for sale. I’ve dabbled with the idea of setting up a little shop at abebooks.com for a few years now, but nothing jogs backburner projects quite like upcoming maternity leave. Among the books I need to cull from the collection are the “extras” in my Dumas collection. This should be easy. I’m up to fourteen copies of The Three Musketeers alone (if you count the purse); you’d think there’d be an easy choice or two in there. Heck, I have several exact duplicate editions in the collection. Except that’s not quite true – exact duplicate is a hard thing to find. I maintain the practice of “upgrading” copies – buying duplicates of books I already have if the newer copy is “better” in some way. Of course, “better” is a completely elusive concept, especially when dealing with books which have been released in thousands of editions over hundreds of years. Nevertheless once in a while I do pick up second copies of theoretically identical books, only to find they aren’t identical enough to make an easy decision. On the left, my old copy of The Countess Du Barry by Alexandre Dumas, published by Collins Clear-Type Press around the turn of the 20th century. 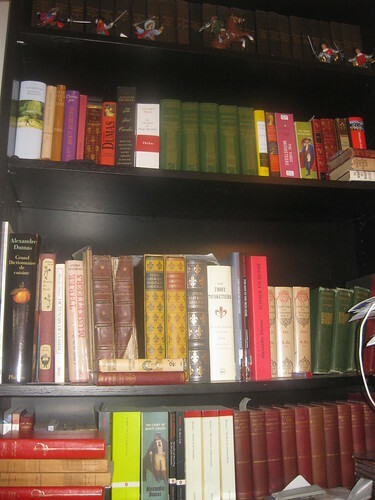 On the right, the new copy of The Countess Du Barry by Alexandre Dumas, also published by Collins at the turn of the 20th century – but with dust jacket. This ought to have been a no-brainer update. The dust jacket has even kept the covers of the right-most book in cleaner condition. The maroon is darker, the gilt is stronger. But a few moments after settling into my new copy I noticed two problems: one, the ink on both the type and the plates in my new copy was extremely light: faded or never printed properly. And two, the pagination was different. I whipped up a quick collation formula for both books to suss out the difference. The differences were slight but there. The plates were inserted in different places in the 2nd copy, though as plates aren’t usually included in the page count, this didn’t account for the difference in pagination. On the other hand, the first copy has a half-signature (sometimes called a quire) worth of advertising at the back. The text of the book is the same – identical in fact, I’ll get to that in a second – but because the book had been laid out with this extra apparatus in mind, the pages were printed in different signatures, and folded into the book differently. With me so far? Okay, so who cares, right? Well, based on the evidence, I can draw some conclusions. Collins Clear-Type Press might have been based in “London & Glasgow” (as reads the title page) but, in fact, Collins Pocket Classics were printed all over the place, notably in the United States. Stereotypes of the pages (full-page casts) would be taken and shipped to big markets to be printed locally. Now, stereotypes could be used again and again, and it’s quite common to see real degradation in the print quality of these prints. The advertising in my first copy indicates the market was British, so it is likely a London print job. I suspect my “new” copy was printed in the US later, from stereotypes. The advertising would have been removed as it wasn’t relevant to the local market. So I have one older, reasonably well-printed copy of a book with complete with advertising pages, but no dust jacket. Then I have a second, poorly-printed copy, printed later probably in another country, with no advertising but with a dust jacket. What’s a girl to do? My first instinct (bad book historian!) was to take the dust jacket from the second book and put it on the first, getting rid of the now-jacketless American copy. But this is fraught with dangers if authenticity is one’s goal. Who knows what the dust jacket of the British edition looked like, or if it even had one? Who knows if the dust jacket on the American one is even authentic – maybe someone switched them earlier? There’s a price on the spine that looks like British notation to me. Until I know, I’m inclined to keep everything as it is. Sit tight, wait for more evidence. And in the meantime, I have five copies of the Countess Du Barry on my shelf, two of which are nearly identical. My culling project is off to an inauspicious start. It’s a hard thing to part with books! But I’m forging on. Space must be made. This blog post showed up as the top hit. I would keep them both and cull more from a different group (one you weren’t collecting) but I may not be a completely reasonable human being when it comes to books either. I would keep both precisely because of everything you’ve noted here, for interest’s sake. 🙂 I found this all genuinely fascinating, and also you remind me of when I read People of the Book and wanted to become a rare book expert. Your affinity for this kind of stuff, I think, can take you really far. Especially if technology is going to make paper books more valuable in the future. I mean, who knows. Seriously, though, is it time for a career change? I’m really impressed. Back to Dumas: my first instinct was to say put the dust jacket on the other copy, too, but as you say, it’s not the same, then, and kind of like cheating. I wonder if you can find another copy of your edition on the left, but with a dust jacket. Then you could replace your two with that one. Except that it’s likely to be expensive. Interesting! I am also a great fan of books…books and more books, I buy old books because I believe there is always somebody that will appreciate the written word and story’ s on real paper. I live in Holland, we have some bookshops here, but not as many as we used to have in the past. I buy ….keep….and then try to sel on at marktplaats a dutch site. In your case, i would not change the dustcover….you dont seem to be the type of person that tricks people into buying none genuine stuff. Aspecially because of all the time you spend on finding out the ” truth” behind the differences in your books.